There are a million different bike designs out there, each suited to a different terrain. The Continuously Ergonomic Race Vehicle—Or CERV—is Cannondale's attempt at making a single bicycle that can adapt to the course you're on. It's a bonkers concept that looks just as crazy as it sounds. Immediately upon looking at CERV you know there's something weird about it. 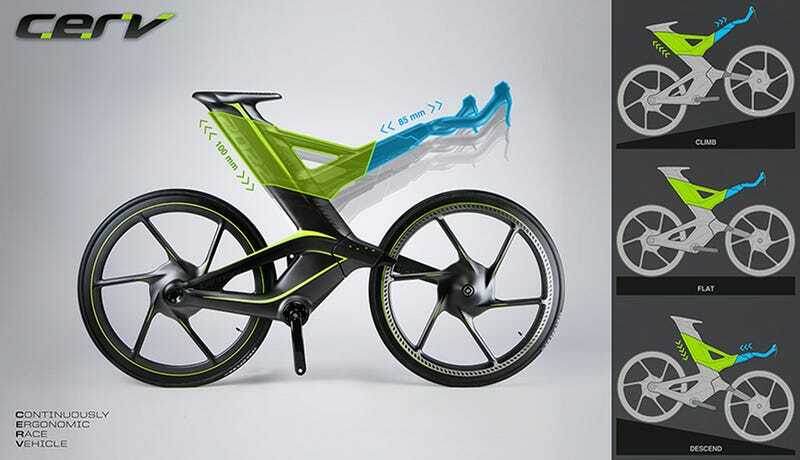 The actual working prototype of the chainless, forkeless concept was built by Priority Designs for the EuroBike 2012 design show. The bike's front end is adjustable to different heights depending on whether you're in the middle of a tough climb or a downhill sprint. The key to the design is that even as the handles rise and fall, the distance between the saddle and the crank remains the same. The problem, of course, is that on most bicycles, the fork is essential for steering. That means that the mechanics of the bike's steering had to be completely reengineered to suit the adjustable design.